When I met Dana, we were far from carefree. I mean we had big things to worry about. Things like whether our Martha Stewart inspired cranberry wreaths were pure perfection. (Mine wasn’t.) Or whether too much wine had us caroling a bit off key as we wandered through town. (It did.) I mean your twenties, they’re no joke. At least it seemed that way at the time. But now, all these years later, I reconnected with my old friend through social media, only to discover life took a very serious turn for her along the way. So today, in support of Breast Cancer Awareness Month, I’ve asked her to share her story, not only of survival, but of hope. I vividly remember Friday, September 7th, 2007. I had started that week with so much excitement and joy. I was 37 weeks pregnant with our first child and had just started my maternity leave a few days before. My pregnancy had been healthy and uneventful, but I had felt a lump in my breast and thought it was a blocked milk duct. An innocent ultrasound turned into a week of turmoil, culminating with a diagnosis of breast cancer on that day. Our life was shattered and our birth plan was discarded, but our sweet daughter, Isabella, arrived healthy and happy just six days later on September 13th. She was the best medicine we could ask for! I was given just six precious days of breastfeeding and bonding, and then had a lumpectomy and lymph node removal on September 20th. My pathology and staging was Stage 3C (ER+ with strong HER2 over-expression = aggressive!). My original lump was 3.7cm and unfortunately there was cancer present in 10 of 13 lymph nodes. Six weeks later I started chemotherapy, which included 6 rounds of FEC-D for five months followed by 30 rounds of daily radiation treatments, finishing in May 2008. Once completed, I took daily Tamoxifen pills and monthly anti-estrogen injections and enjoyed good health for 18 months—until I recurred in January 2010. The cancer had returned in the same breast, so I had a mastectomy on my left side, plus more lymph nodes removed. They showed evidence of cancer, as well. Back into chemotherapy, this time I was doing the AC-T regimen for a total of 14 treatments. My follow-up care was daily Exemestane pills, plus monthly anti-estrogen shots, until my oophorectomy (ovary removal surgery) last year. Also, about 3 years ago they discovered small spots on both of my lungs. They’ve been too small to biopsy, but present as possible metastatic breast cancer to my lungs. We have been monitoring those closely and I have been on an immunotherapy regimen since April 2013 to be proactive…just in case. So this October, Breast Cancer Awareness month, I am thankful to be able to share my journey to spread awareness and provide guidance and support to so many. It’s been 7 years, 2 battles, 6 surgeries, 3 missing body parts, 20 doses of chemo, 30 rounds of radiation, 7 threatening shadows, hundreds of injections, numerous maintenance pills, lots of scans and too many hours of scanxiety…but I am ALIVE and thriving and so very thankful! Please don’t get blinded by “the pink” of this month. Heed the message. Be proactive. Don’t think that it can’t happen to you, your sister, your mother, your father, your friend. Only 5-10% of breast cancers are hereditary — the other 90-95% are a total crapshoot, like me! Get your mammograms. Know your breasts. Don’t ignore changes. Trust your instinct. Get second, third and fourth opinions. And if you ever hear those 3 dreaded words: “You have cancer”, please know that you are not alone. Stay positive. Lean on others. Take each step as it comes, one day at a time. You CAN and WILL beat the beast! Viva La Cure! Just like Dana’s powerful story of triumph, I heard others while attending a special session focused on advanced breast cancer at BlogHer ’14. It was hosted by several advocacy organizations and Novartis, who have partnered to help bring awareness to the advanced breast cancer (stages III and IV) community with Count Us, Know Us, Join Us—an advocacy site for patients, caregivers, friends, and more. There’s absolutely no easy diagnosis when it comes to breast cancer—or any cancer for that matter. I have many friends who have fought long, hard battles in every stage of the disease. But advanced breast cancer can be especially isolating, as it’s the most life threatening form of the disease. Should you or someone you know be faced with this battle, please know that there are resources especially for you and your loved ones at http://advancedbreastcancercommunity.org/. A bit about Dana: I am a Canadian girl who has worked almost 20 years (!) for an international classic car auction house. I spent the first 10 years of my career moving to and from LA (where I met Amy), and traveling around the globe as our business grew; the last 10 years have been back in my hometown, Blenheim, Ontario. 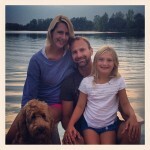 My husband, Paul, our 7-year-old daughter, Bella, and our goldendoodle, Jessie, live on lovely Lake Morningstar where we enjoy swimming, sleepovers, sunsets, and surrounding ourselves with family and friends. I am a card-carrying Instagram-aholic and end each day with my Daily Gratitude photo and #dailygratitude2014 post—the most amazing and life-changing challenge I have taken on to date! Photos taken by Melissa Doyle of Casting Memories Photography. Melissa aims to capture joy despite health challenges, and her talent has been tapped several times by Ronald McDonald House, Now I Lay Me Down To Sleep, Operation Dream Lift, and many other charitable organizations. Cheers to you: brave, articulate, wise Dana. I am heartbroken that Dana lost her fight with this horrible disease this past weekend. She was an inspiration to all. Elaine, it has been such a sad week saying goodbye to Dana. May we all continue to fight the fight on her behalf, and love the life we’ve been gifted. Sending love to you as you mourn a wonderful friend and inspirational woman.